I’m no stranger to a good burger—or any burger, really—but a good burger and I get along like peas and carrots. Generally, I shoot for a 70/30 ratio of lean meat to fat for my burgers. Because of the added butter in this Butter Burger Recipe (and lets be honest, who doesn’t love butter right? ), I use an 80/20 lean to fat ratio. 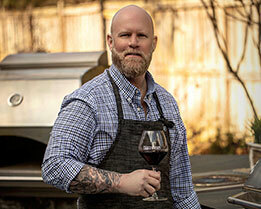 This healthy change is how I maintain the Adonis-like figure I’ve worked so hard around the grill to develop! This isn’t a burger I recommend grilling, instead I like to do these on the Lynx Asado flattop. 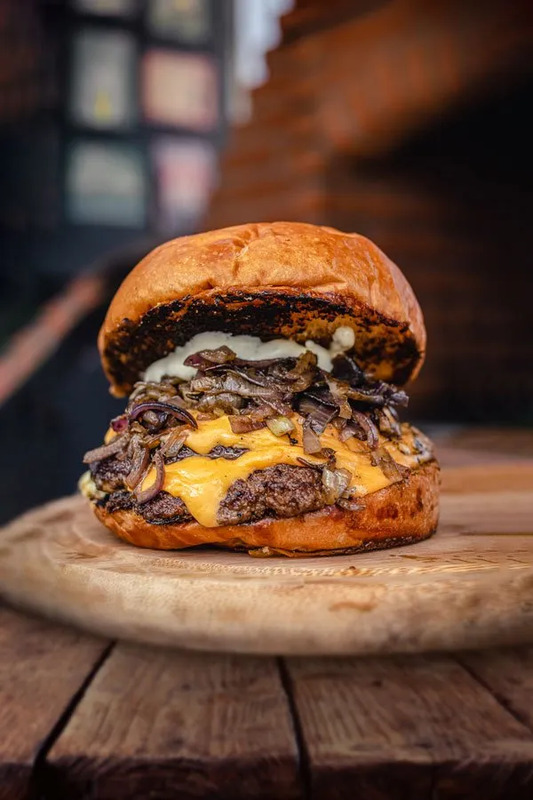 This allows the burger to cook in it’s own juices and even more importantly, form that incredible crust we all love on a diner-style burger, this one amped-up with butter—let’s get it! Serves: 3-4 | Prep time: 20 mins. | Cook time: 12 mins. Step 1: Prepare a flat top griddle or cast iron skillet to high heat. 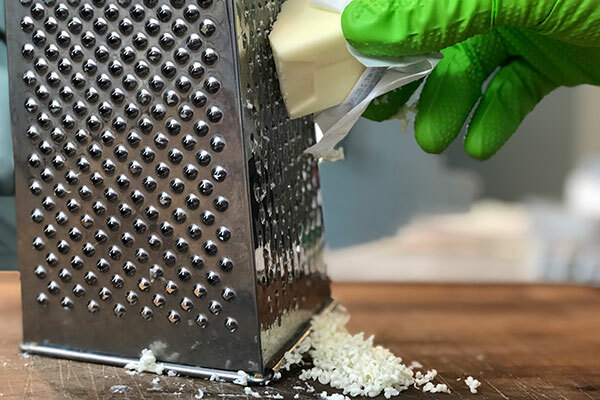 Step 2: Using the fine side of a box grater, grate the butter. 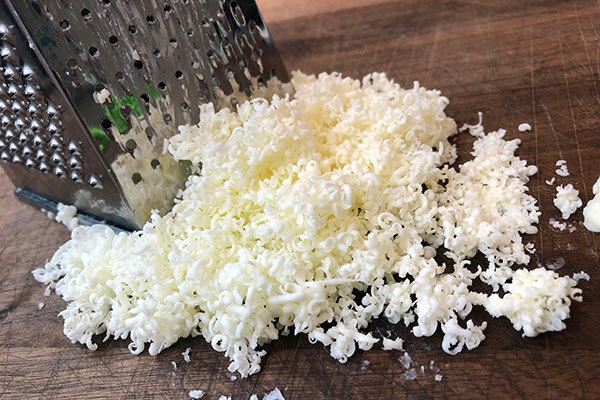 GRILLSEEKER SECRET: One stick of butter looks like a lot when it grated, but remember it’s still only one stick. Step 3: In a bowl, mix ground beef, grated butter, salt, and pepper thoroughly, by hand. Step 4: Form the meat into 6 or 7 patties, depending on how big you want them. When making the patties, don’t over-pack them. You’re looking for a sort of loosely formed patty about 1/2-inch thick. 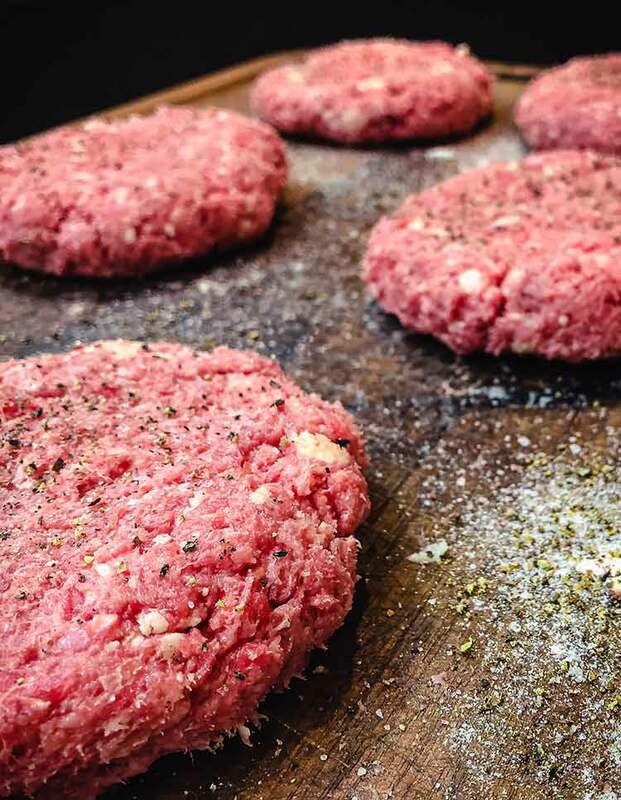 GRILLSEEKER SECRET: Press a small indent into the center of each burger. This prevents the burgers from cupping during the cooking process. Step 5: Sprinkle salt and pepper on top of the patties. I like a generous amount of both, but use what you’re comfortable with. Step 6: Pour 1 tablespoon vegetable oil on the flat top or cast iron griddle and allow it to heat up for about 45 seconds—it won’t take long. Place onions in oil and sauté about 3 minutes before adding the burgers. Step 7: Next to the onions, add remaining oil and place burgers on a hot surface. Cook for about 4 minutes. This will form the perfect crust. Step 8: Flip the burger, placing a slice of American cheese on top of each. Then top with sautéed onions and and another piece of cheese. Step 9: Cover burgers with a griddle dome and allow to cook 2 minutes. The dome will trap in the steam and melt the cheese. Step 10: While cheese is melting, place the buns face down on the flat top to get them lightly toasted. Step 11: Remove the buns from the flat top, placing burgers onto the bottom buns (I normally go for a double as you can see). Top your burger masterpieces with sautéed onions and ketchup. Prepare flat top griddle or cast iron skillet to high heat. In a bowl, mix ground beef, grated butter, salt, and pepper thoroughly by hand. Form the meat into 6 or 7 patties. Sprinkle salt and pepper on top of patties. Pour 1 tablespoon vegetable oil on the flat top or on your cast iron griddle and allow to heat up for about 45 seconds. Place onions in oil and sauté about 3 minutes. Next to the onions, add remaining oil and place burgers on hot surface. Cook for about 4 minutes. 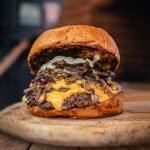 Flip the burgers and place a slice of American cheese on top of each. Then top with sautéed onions and and another piece of cheese. Cover with a griddle dome and allow to cook 2 minutes. 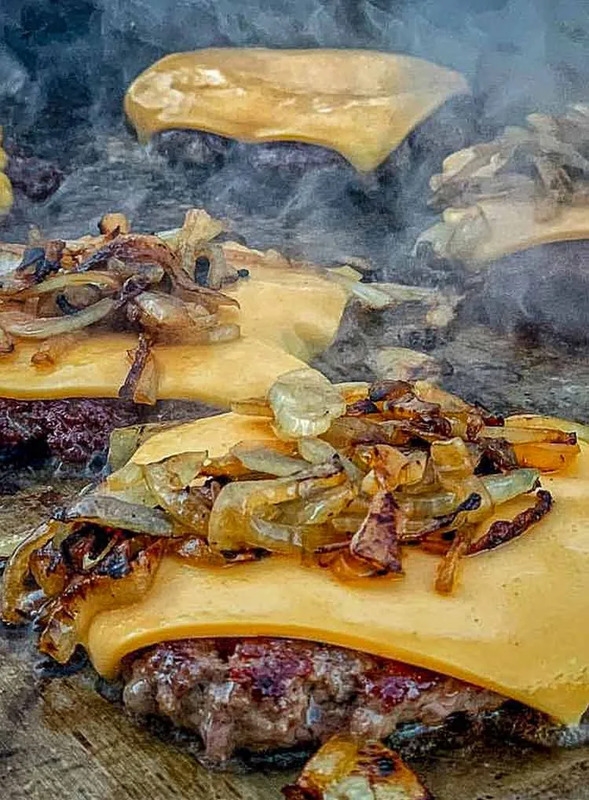 While cheese is melting, place the buns face down on the flat top to get them lightly toasted. 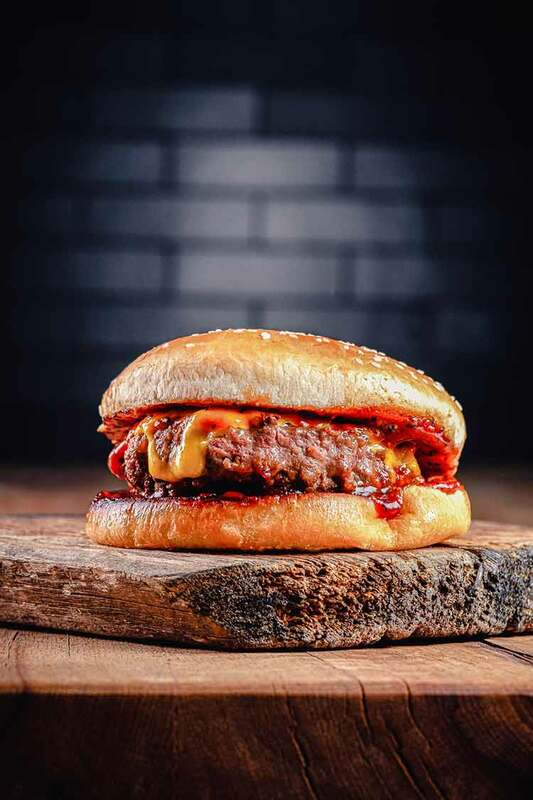 Remove the buns from the flat top, place burger onto the bottom bun, top with sautéed onions and ketchup.